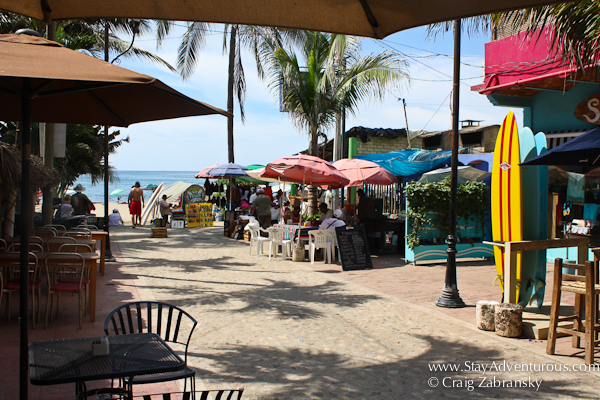 The seaside town of Sayulita has been on my “must visit” list in Mexico for years. The surfer-yoga enclave intrigued me from the very first day I heard about it, a day well before I ever I fell in love with Mexico. 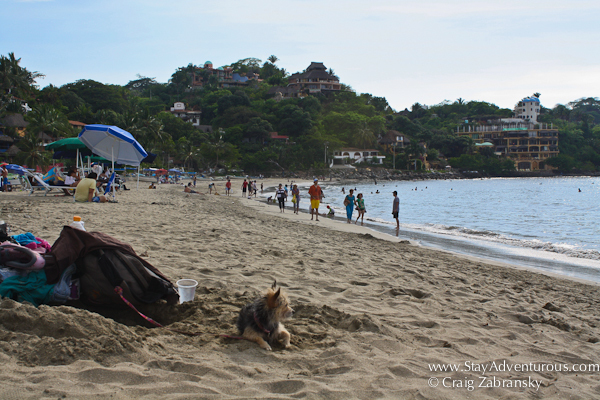 An hour north of Puerto Vallarta along the pacific coast’s the small beach hamlet of Sayulita continues to grow in size and popularity. Here the perfect climate, along the Rivieria Nayarit provides a perfect chance to try outdoor activities, especially getting out on the water. 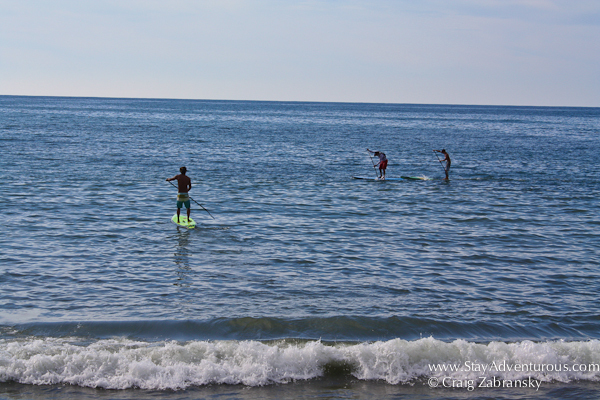 One popular option, besides classic surfing is Stand Up Paddleboarding or SUP. First off, it is not as easy as it looks. I normally surf a long board, nine feet, and can stand up and catch waves without much of a problem and my SUP board was even bigger, (bigger is better and easier to stand on). I thought piece of cake. Nope. Plus, when I watched others easily paddling along the water, I thought I got this, but I discovered there is definitely a learning curve. Plus, the curve is steeper when the water is choppy, which was the case on my day out on the water (stay making excuses). Of course, I eventually did get up a few times (yes, I fell a few times too) and I did paddle across the ocean some, but I never fully mastered it, not this time. Who is a master after their first time anyway, right? Practice and patience were needed, but since I was being filmed across my Riviera Nayarit adventure, I had just a few moments in the water, and with a go-pro, I needed to kneel down for some better footage. Here is a sample of my paddlesurfing experience. Instruction on where to stand on the board is critical. At first I didn’t have any, but I did debrief after my experience, make sure you ask for the basics when you rent your first SUP. Also, realize it’s a great full-body work out – wow. It exercises more muscles than you think. My final bit of advice – enjoy it. I know I did and I’ll be back out there soon. Special thanks to my film crew, Riviera Nayarit TB and the Visit Mexico folks for providing access to a SUP board in Sayulita. The experience was a needed humbling after I stuck my drive 12 feet from the pin at the natural island par 3 Tail of the Whale the evening before. This post is part of the Mexican March Madness Series for 2014. I LOVE SUP. It’s a great sport and so much fun. i hope you will keep doing it. Maybe if we are out in the world together maybe we can have some SUP fun. Stop…could you be any more lovable? I don’t think so. LOVED the video. Okay, so this is making me a little sad because I was looking into visiting Rivera Nayarit for spring break…oh well, I am sure I’ll get there one day soon. I also have yet to try SUP. This is very inspiring though. Motivation to give it a go. I’ve never done this. I want to, and hope to this summer when I finally make it to Mexico for the first time. I’d have to start out in the pool. Is that possible? Did anyone say What SUP when you paddled by them? Probably not as you went by in a blink of a time. You are such a pro that you made that ocean eat your SUPper. That is all I got on the way of SUP jokes.